Aften enduring the first-year Calculus I and Calculus II courses on single-variable differentiation and integration theory, undergraduates earn admission to the course where Calculus actually gets fun: 3D Calculus - the Calculus of many variables. 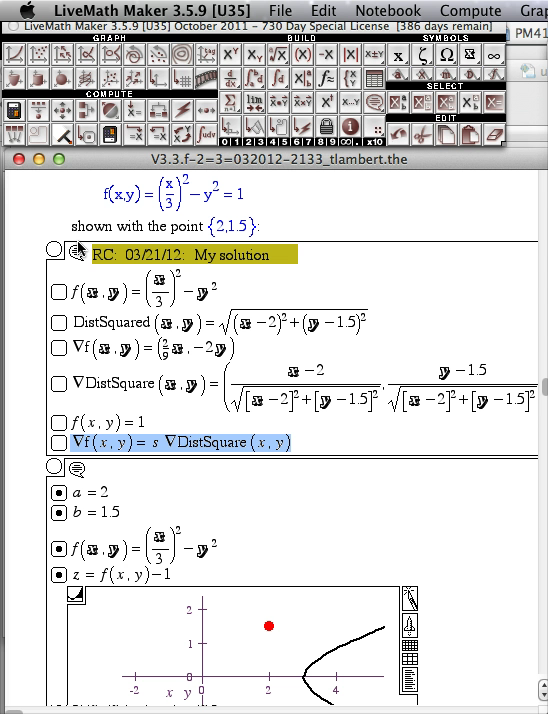 How does this change to 2 input variables x,y change the theorems of Calculus? What does the Fundamental Theorem of Calculus look like for f(x,y)? What does it mean to take "the derivative" of f(x,y)? What does it mean to take "the integral" of f(x,y)? 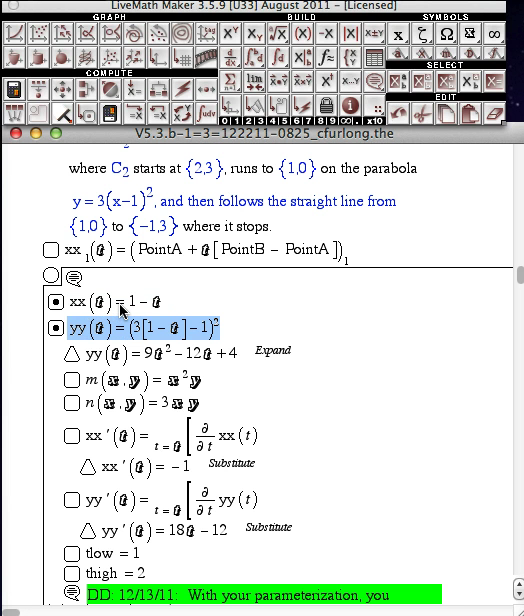 In Multivariable Calculus, the graphics from the computer algebra software really come alive. In 2D Calculus, the graphs are rather pedestrian, not much above those graphs you can generated on a graphing calculator. 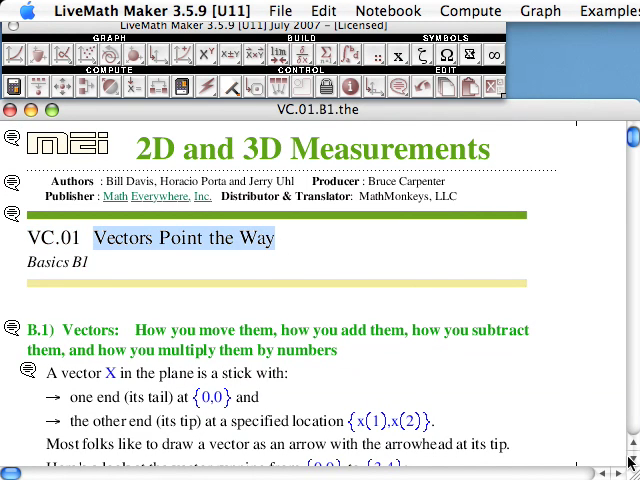 In 3D Calculus, the computer graphics become an indispensible part of the investigation - as essential as needing a microscope to do Biology, or beakers and solutions to do Chemistry. A very short mini-course on getting up to speed using our computer algebra and graphing software, LiveMath. 10 short assignments. The generalization of the derivative f'(x) is the gradient vector field ∇f(x,y). In 2D Calculus, the derivative function f'(x) is graphed along with the original function f(x), and the derivative f'(x) is used to measure change (and critical change points) on the function f(x). In 3D Calculus, the "derivative" of f(x,y) is a vector field, and can be visualized as lying in the input 2D x-y-plane. 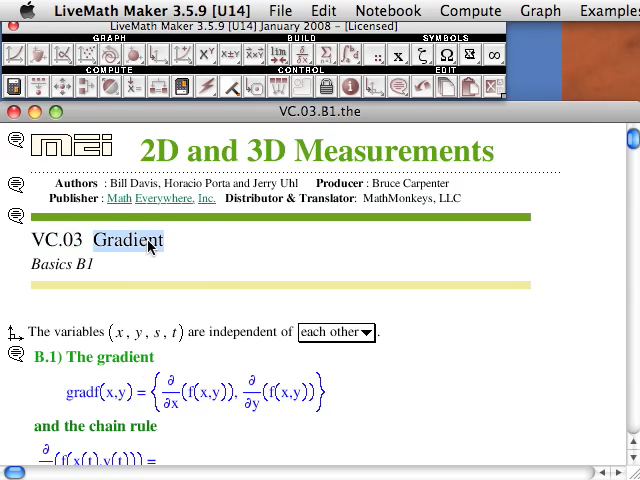 We learn how this gradient vector field is used to analyze the properties of the f(x,y) function. In 2D Calculus, we take integrals of functions f(x), which give us information about the function with different interpretations (area, physics computations, accumulation). 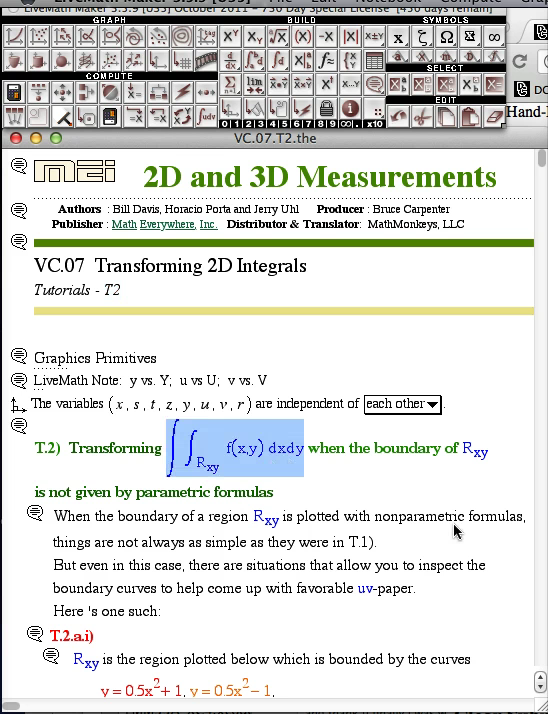 In 3D Calculus, the integral is formulated in various ways. Adding a second input variable turns out to complicate matters considerably, and we have to formulate "what does this mean" to overcome these obsticles. The Fundamental Theorem of Calculus in 1 variable says basically that if you integrate a derivative, you get back to the original function f(x) But in 3D Calculus, the derivative f'(x) becomes a gradient field ∇f(x,y), so what does it mean to integrate a vector field? This question leads us figuring out what integrals mean in higher dimensions. It is not just "more integrals" as you might expect (and as many traditional textbooks may lead you to believe). The Generalized Fundamental Theorem of Calculus has many names: Gauss-Green Theorem, Stokes' Theorem, and the Divergence Theorem - all names unified into the GFTOC. The third semester of a 4-credit hour Calculus sequence, as it is in our Distance Calculus program. Usually the fourth quarter of a 3-credit hour Calculus sequence. An appropriate title in that we study vector fields and the generalization of the derivative; most textbooks for this course entitled this way, too. The most descriptive moniker, encompassing all aspects of Calculus of more than 1 variable. At some schools, "Calculus III" is actually the course that contains the topics in the second half of Calculus II: sequences, series, Taylor's Theorem. We do offer a "bridge" course for Calculus III for those students who have completed Calculus I and Calculus II via a quarter-based system, and need this "last part of first-year Calculus" to bridge into the second year courses. At some schools, the Multivariable Calculus curriculum is called "Calculus III", with the intention of the higher multivariable calculus topics of vector fields, partial derivatives, multiple integrals, gradients, path integrals, and Gauss/Stokes/Divergence Theorems. When non-traditional, older students are returing to academics, after a break that can span years or even decades, a most common question is: Where should I re-enter in the Calculus sequence? If you have completed the Calculus I and Calculus II courses previously (even decades ago), and the concepts of differentiation and integration are remembered at a modest level, then an excellent course to return to the Calculus sequence is via the Multivariable Calculus course. For the student, Multivariable Calculus is where you usually learn - really learn - the topics from Calculus I and II - not because Multivariable Calculus is harder, but just that you revisit the topics from Calculus I and II, but now looking for how these concepts will generalize from a single variable to multiple variables. It is through this generalization process that many students have the "ah-ha!" moment with the original topics from single variable calculus. In case you did complete Calculus I and Calculus II previously, but you do not remember the basics of differentiation and integration, then returning to Calculus I or Calculus II is the best plan for success in Multivariable Calculus. Phew! Getting through Calculus I and Calculus II is an achievement! But if you are a science major, most likely Multivariable Calculus is next on your to-do list. One indicator of how fast a student can complete Multivariable is the grade earned in Calculus II. Marco is a undergraduate engineering major, and part of his degree program dictates that he finish Multivariable Calculus. Marco did pretty well in Calculus I and Calculus II. Rather than more lectures/taking notes/Problems 1-99 odd, Marco wants to change things up, and to take the Multivariable Calculus course via Distance Calculus. How fast can Marco complete the Multivariable Calculus course? The answer to this question depends mostly on when Marco plans to work on the course. The most successful time for Marco would be during winter, spring, or summer breaks from his regular course load. By modifying his schedule to work on the Multivariable course during these "off times", Marco will be able to concentrate and focus just on the Multivariable Calculus course, and his tendency towards success will increase dramatically. Karen just got accepted into Graduate School in Economics towards a Ph.D. She has a conditional acceptance, and must finish Multivariable Calculus in a very short time. Karen also works full time. What must Karen do to finish Multivariable Calculus? The "short time" needs to be on the order of 3-4 weeks for Multivariable Calculus. Anything less is quite impossible. While Multivariable Calculus is a bit easier than Calculus II, the Multivariable Calculus course still has its challenges, and time-on-task will still require a significant time committment with enough rest spots for the concepts to "sink into the brain sponge". Karen will need to plan for large blocks of time to dedicate towards the course. If shooting for 4 weeks completion, then at least 8-10 hours per day. If shooting for 6 weeks completion, then 6-8 hours per day, every day. It will be a very challenging 4-6 weeks. Karen should also be ready that the course takes a little longer than the planned 4-5 weeks. Going a week or two over to 6-8 weeks is quite common. Usually graduate schools are quite understanding of the situation of "I'm almost done", and in many cases, the graduate school will give a short extension to aid the student with harsh deadlines. Karen must understand that even though there are some tough deadlines with this plan, that does not mean that "corners are cut" in the Multivariable course because of these extenuating circumstances. There is only 1 way through the course, and that is the right way. Thomas is applying to Graduate School in Biostatistics towards a Ph.D., and will start in 1 year. Thomas knows she must complete Multivariable Calculus prior to starting that course work (and even before submitting the graduate school application). What will the Multivariable Calculus course look like for Thomas? The typical path for students like Thomas is the 8-10 week plan. Mike took Calculus I and Calculus II and did OK in the courses, earning C grades. Then Mike went onto Multivariable Calculus, hoping to improve his grades above the C level. One thing led to another, and Mike didn't succeed in the traditional, classroom Multivariable Calculus course. Mike loathes the thought of returning to the classroom lecture for Multivariable. The lectures were not that much fun going through them the first time, and trying to sit through them a second time will be more than just painful. Mike wants to change gears, and try something new - taking Multivariable Calculus via Distance Calculus. Typically, students like Mike will take the course over the summer months, and be able to focus just on the Multivariable Calculus course, without being overwhelmed by multiple courses all vying for Mike's attention. Mike should plan to take a step back, a deep breath, and engage the course as if starting on a marathon race. Just because Mike "had Multivariable Calculus already", this poor foundational knowledge will not help Mike succeed in this second (and quite different attempt). Mike would be approaching Multivariable Calculus from a completely different viewpoint than his previous attempt, which certainly goes a long way to minimizing the "review" nature of repeating a course. When going through the new Multivariable Calculus course, all will see things he saw before (e.g. partial derivatives, path integrals, etc. ), but completely different types of questions that he probably saw in the classroom/textbook course. An open mind, and genuine academic curiousity to investigate and embrace the new style of work will be required for success. Mike should plan for a minimum of 12 weeks to engage the course, even during the summer. It will take time for the course concepts and materials to "sink in" and become comfortable. We have had many students like Mike succeed in Multivariable Calculus where their classroom experience with Multivariable Calculus was a failure. However, we have also had many students like Mike who discover that the reason they didn't succeed in their first attempt at Multivariable Calculus was an indicator that their math skills are not strong, their interest in math is weaker, and their chosen course study plan may need to change upon failure in two different course paradigms. Rebecca is a hot-shot high school student. She has completed AP Calculus BC exam (equivalent to Calculus II), and now she is ready for the next course. Few (if any) high schools offer the course after AP Calculus BC, which is the Multivariable Calculus course. Rebecca will most likely be able to finish the Multivariable Calculus course very quickly with a dedicated effort that is quite natural for her. 6-8 weeks is the common time frame. However, Rebecca may discover that Multivariable Calculus via Distance Calculus is an adult course, and quite unlike the high school course paradigm that he has been so successful in previous. Some students like Rebecca can find Multivariable Calculus more difficult than they anticipated, and they have to dedicate more time and effort than they had planned to budget for. While Rebecca can earn collegiate credits for Multivariable Calculus in a similar way that AP Calculus BC would earn, Rebecca would not benefit from the inflated GPA multiplier that AP courses help with high school GPAs. Over the past 16 years, Distance Calculus has enrolled thousands of students who successfully complete the Multivariable Calculus course, and use this course record towards undergraduate and graduate programs at various colleges and universities in the U.S. and throughout the world.